Beauty and looks is very important as far as today’s lifestyle is concerned. Good looks besides making you more presentable and bring a lot of inner confidence. However, due to the increase in dirt and pollution, today we seem to suffer more from the various skin and hair problems. There are so many commercial products in market for skin and hair care, which promises fast improvement. Youngsters today in the hope of having glowing skin and gorgeous hair spends so much money buying those products. But do you know that these costly products can often cause harm to your skin and hair? In order to avoid such a situation it is always better to trust on natural products which are safe as well as cost effective. The moment we think of natural products for beauty and skin care, the first name that comes to our mind is Fuller’s Earth. And today in this post, I am going to discuss about top 20 benefits of multani mitti or fuller’s earth on skin and hair. Fuller’s Earth more popularly known as “Multani Mitti” in India is a gift of nature for hair and skin care. It is a clay that is believed to be originated from a city of Pakistan called Multan. So the name is directly derived from “clay from Multan” and is known popularly as Multani Mitti. Multani Mitti often called “healing clay” is known best for its cleansing properties. The English word “Fuller” is a name that comes from the wood textile workers who created a timesaving concoction to remove the dense oils from sheep’s wool. This brew included water, urine, soapwort and this clay. There is a lot of usage of Fuller’s Earth in the film industry. In the area of special effects, it is used in pyrotechnics explosions and dust clouds, because it spreads farther and higher than most natural soils, resulting in a blast that looks larger. It is also safer than naturally occurring soil, should the blast spray hit actors. The material was used in the tornado sequence in The Wizard of Oz as the artificial twister plowed its way toward the farmhouse. Fuller’s earth is also widely used by the make-up, props, wardrobe, and set dresser departments, because it is considered “clean” dirt, safer to use around people and it cleans up easily. In the Indian subcontinent, it has been used for centuries to clean marble. As a good absorbent, it removes dust, dirt, impurities, stains from the surface, and replenishes the shine of the marble. It has been used numerous times to clean the Taj Mahal in India with positive results. Anyways, before discussing about the benefits of multani mitti for skin and hair care, let us take a look at the constituents that makes Multani Mitti such a useful ingredient for skin and hair. Fuller’s earth consists primarily of hydrous aluminum silicates (clay minerals) of varying composition. Common components are montmorillonite, kaolinite and attapulgite. Small amounts of other minerals may be present in fuller’s earth deposits, including calcite, dolomite, and quartz. In some localities Fuller’s Earth refers to calcium bentonite, which is altered volcanic ash composed mostly of montmorillonite. Kaolinite Al2Si2O5 (OH) 4 – It is commonly used in production of paper to ensure glossy look on coated papers. Calcite (CACO3) – It is derived from German word “Calcit” and is used as a Latin word for lime also known as chalk. It is also used in medicines and is believed to absorb bacteria that cause diarrhea. Attapulgite (Mg, AL) 2Si4O10 (OH) •4 (H2O) – It is used in the manufacturing of Maya Blue. Dolomite (CAMg (CO3)2 – It is described as a rock by French archeologists. Montmorillonite (Na, Ca) 0.33(AL, Mg) 2(Si4O10) – Commonly used in oil drilling industries for drilling mud. Traces of Quartz SiO2 – It is commonly known as silicon crystals. Uses of Multani Mitti for beauty purposes are not new for people, especially in India. Mankind is using Multani Mitti from centuries for their skin and hair care needs. In history, we have many stories of those enchanting goddesses who used this magical clay to increase their divine beauty. Fuller’s Earth or Multani Mitti is nothing less than gold, especially for skin and hair care. There are innumerable benefits of multani mitti or fuller’s earth for skin and hair. 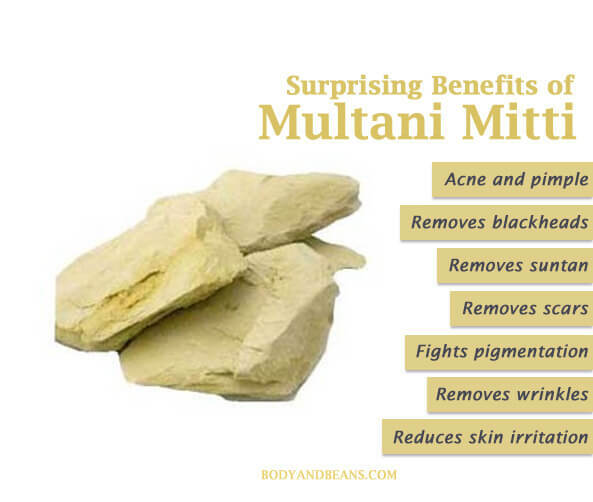 Listed below are the top 20 benefits of multani mitti that you may not be aware of. Suffering from oily skin problems? Multani mitti can be the perfect solution for that. Fuller’s earth works wonders for oily skin. Oily skin easily attracts dust and other impurities from surrounding. These particles clog the skin pores and may cause pimples and eruptions on face. Multani Mitti is a blessing for those with oily skin. Multani mitti is really beneficial for oily skin because it absorbs excess oil from the skin surface and makes it soft and smooth. It avoids the occurrence of pimples caused due to excess oil secretion. Besides oily skin, Multani Mitti is also beneficial for dry skin. Dry skin leads to rashes. The skin becomes rough and looks very dull and lifeless. In order to bring back the moisture and make you skin soft, you can use Fuller’s Earth or the Multani Mitti. Just mix some milk and almond paste into Multani Mitti powder and apply it on your skin. Repeat the process on a regular basis and regain the lost softness of your skin. However, usage of an oiling agent along with Fuller’s Earth is very essential as it might leave your skin drier. In order to have a soft, glowing skin it is very important to properly cleanse your skin. Going out, exposes your skin to a lot of dirt and impurities that damage your skin largely and often lead to breakouts. However, Multani Mitti is a very good cleanser. It not only cleanses on the surface but also deep underneath the skin surface. It removes all the dead cells and cleans the pores from impurities. Proper scrubbing of your skin is also very essential for having a healthy skin. Our skin cells die every day and get replaced by new cells. This is a natural phenomenon. The dead cells make our face look dull and lifeless. We keep buying scrubs to exfoliate our skin or to remove the dead skin cells. Benefits of Multani Mitti on skin are manifold. It acts like a natural scrub and exfoliates the dead cells very effectively, leaving behind a very glowing skin. When in hurry, and no time for applying a face pack and waiting, you can use Fuller’s Earth for scrubbing purpose. There are two ways to scrub your skin using Multani Mitti. You can use roughly grounded almonds or walnuts. If you do not wish to use these nuts, you can use some sugar granules with Fuller’s earth and scrub your face softly with this mix. Wash it off and you will see a clean, glowing skin in minutes. Your skin needs proper toning as well. It stimulates the skin and helps in proper circulation of blood throughout the face. Toning is an important step between cleansing and moisturizing. Toning helps regain the pH balance of your skin quickly before moisturizing your skin. Besides ,it also tightens your pores. It clears any leftover dirt from your skin as well as reduces inflammation. Multani Mitti’s bleaching effect helps in lightening the blemishes and acne marks too. It helps in improving the skin tone and gives a bright glow and radiance on the face. Having pimple or blemishes on your skin can actually be a nightmare. Pimples are every girl’s foe. The oiliness of face is one of the main reasons for the development of pimples. Excess oil clogs the pores of the skin. Dirt and bacteria accumulate in the clogged pores leading to pimples. No matter how you look, having a flawless glowing skin always add to your body. Multani Mitti can be used for removing pimple marks and blemishes to have an even tone. To make an anti blemish and anti mark pack, mix Multani Mitti with tomato juice or lemon juice and add a pinch of turmeric to it. For best results, apply this pack at night before sleeping and after washing your face off, apply anti tan night cream. This will help you in having a fairer, brighter and a more evenly toned skin. In people with acne, an excess oily substance called sebum is produced at the base of hair follicles. This sebum contains many melanin or black pigment-producing cells called melanocytes. When exposed to air, the acne spots turn black due to the effect of melanin. These are called blackheads. Blackheads on the face can be quite annoying. Good news is that Multani Mitti can help you to get rid of blackheads. In addition to blackheads, Multani Mitti also helps you to get rid of whiteheads. People having certain skin types are more prone to develop suntan. When we look into the mirror, suntan makes us feel terrible. However, using Multani Mitti face mask regularly, you can reduce suntan very easily within no time. I am sure that one wants to have scar marks on the skin. So if you are facing such problem, I have the remedy to that. You can use Fuller’s Earth in order to remove the scars. Take some Multani Mitti and mix fresh neem leaves and lemon juice to it. Apply this paste on your scar marks and leave it for some time. Wash off your face after 15 minutes. Applying it for a week will have noticeable effects on your face. This is another severe problem of the skin. Multani Mitti has anti tan properties and helps in getting rid of suntan and ill effects of pollution on your skin. There are various ways to use Fuller’s Earth to fight pigmentation. Take 1 grated potato squeezed to remove its juice, 1 teaspoon of olive oil and 1 teaspoon of glycerine (use only for dry skin) and mix these into Fuller’s Earth. Apply the paste on face, hands and feet and wash it off after 10 minutes. You can also make a paste of Multani Mitti, cucumber juice, raw milk and Vitamin E capsule (piece it and use its extracts) and apply on the pigmented parts and wash off after 10 minutes. 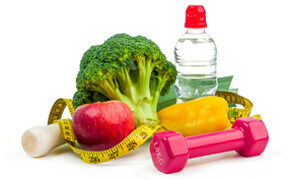 Repeat any of the two procedures on regular basis to get the best results. As we become old, many hormonal changes occur in our body due to ageing cells. Our skin tends to become loose and saggy as we age. Having wrinkles on your face makes, you look very old and dark. Sometimes your skin may develop wrinkles at a very young age. However, not to worry. Multani Mitti acts as an anti- aging agent. It can tighten your skin and reduce the sagging of skin. This will rejuvenate your skin and make you look younger. Take 1 beaten egg, 1 teaspoon of curd and Fuller’s Earth and mix it. Apply this paste on your face and wash after 10 minutes. Try to avoid being under fan, AC or cooler during this time. Remember to wash your face before it dries up to get rid of wrinkles. Selling fairness creams in the market is a million dollar industry today all over the world. People are so obsessed with fairness. Elders are always on the lookout for fair and beautiful brides for their sons and handsome grooms for their daughters. It has become mandatory for every girl in some societies to try out various things to become fair and beautiful. They spend hell lot of money over such products that are not effective at all. In most cases, our skin becomes very dull and lacks glow due to the effect of environmental pollutants, stress, artificial chemical containing skin care products and due to aging. Just use the following method to get fairer skin. Add raw milk and chickpea flour/besan to Multani Mitti. Apply this paste on your body and wash it off after 10 minutes. If you use this paste for a few weeks, you will notice the surprising benefits of multani mitti. Multani Mitti has antiseptic properties, so it can also treat certain types of skin infection if the infection is mild. The application of the paste of Multani Mitti, rose water/milk and Vitamin E capsule (piece this and empty the extract) on your face helps you to reduce the skin irritation. Wash the face after it dries. This face pack help sooth your skin of the skin irritation and itching making the skin smooth. But, if the infection is very severe or if you have any other symptoms like fever, you should consult your doctor immediately instead of just using Multani Mitti. No matter how elegantly you are dressed up, those dark circles under our eyes completely soils your look. This is quite annoying. All you have to do is to apply a Multani Mitti face pack. Grate half a potato and squeeze out juice from it. Mix this potato juice with 1 spoon of lemon juice and 2 spoons of Multani Mitti. Apply this face pack all over your face including the dark circles and rinse well after 10 to 15 minutes. You can see a remarkable reduction in dark circles if you use this Multani Mitti face pack regularly. As I said, Multani mitti is not only beneficial for skin, but it’s also beneficial for hair. You can use multani mitti for hair care because it helps fight hair fall, dandruff and many other hair and scalp related issue. Having known the benefits for skin, let us take a look at some of the benefits of Multani Mitti for hair. We all know that Multani Mitti can be used as a facemask. But do you know that it can be used to promote hair growth as well? You must be surprised to know this fact. However, it really does work to make our hair lustrous and strong. For making Multani Mitti hair mask, you need to follow these simple steps. Just mix 3 to 4 tablespoons of Multani Mitti with 1 to 2 spoons of lemon juice and 1 spoon of amla or gooseberry juice. Now apply this hair mask and leave it for 30 minutes. Then wash your hair with an herbal shampoo. Use this mask for hair once every week. You will notice a profound improvement in the health of your hair after some months. Dandruff is another problem that hampers your hair. However, Multani Mitti is effective in curing dandruff and other scalp related issues. Multani Mitti combined with fenugreek and lemon can give good results. Soak 3-4 teaspoons of fenugreek seeds overnight. Grind it into a fine paste. Mix Multani Mitti powder and lemon juice to make a paste. Apply it on the scalp and leave it on for 30 minutes. If you find fenugreek seeds not suiting, as for some it can cause a cold, then substitute it with pure Aloe Vera Gel. Hair adds to the beauty of the whole face. Having strong bouncy hair therefore is very important. The drastic weather changes, pollution, harmful chemicals and diseases all together contribute to hair losses. If you are suffering from excessive hair loss, you can use a hair pack made of Multani Mitti, a teaspoon of black pepper powder and curd. This paste needs to be applied on the hair for half an hour. Use this treatment twice a week for best results. In order to have gorgeous hair, it is very important to clean your hair on frequent basis. Multani Mitti can be used to treat both oily and dry hair. In case of oily hair, soak 2-3 teaspoons of Multani Mitti in water and use this water to wash your hair. It will remove the excess oil without stripping it of its natural oils. For dry hair mix some Multani Mitti, curd and sesame oil, leave it on for 20 minutes, and then wash thoroughly. The daily exposure to pollution or harmful chemicals often damage the hair. Your hair looks dull and lifeless. If you have dull damaged hair then use some Multani Mitti to give it, some bounce and shine. Make a pack made of Multani Mitti, oil from one vitamin E capsule and curd. Apply it on the hair for 15- 20 minutes and enjoy the results. Just like your skin, your hair also needs proper nourishment. A little bit of conditioning is required to keep your hair glossy. Multani Mitti is a good conditioner; it helps to give you the hair you have wished for. It is completely safe. So, I guess you have noted all the benefits of Fuller’s Earth. Besides this wonder ingredient will not burn a hole in your pocket. At times, we tend to judge the effectiveness of a product based on its price, but do not let the price tag fool you in this case. The low price is actually inversely proportional to the range of benefits you get if you actually use it. Simply put, it is worth every penny you spend and probably more. Just a word of caution: this should only be used externally as ingestion can cause kidney stones and block your intestines. Anyways, start using Multani Mitti and say goodbye to all the skin and hair problems. If you have doubts, you know what to do. Just share all your doubts, tips and comments with me and I will get back to you surely. Till then, stay happy, stay gorgeous.